West Torrens Birkalla continued it’s wonderful form with a 4-1 thumping of Adelaide Comets in the Regional Round in Roxby Downs. The players flew up on Friday night, trained lightly Saturday morning before game time kicked off at 7.30pm and our lads totally dominated from start to finish. Jordan Watson scored another two goals with Paul Radice scoring one and a nice return to form for Akira Miyuyami who also grabbed one. Coach Steve Degiovaniello praised everyone on the park saying every single player gave 100 % – a full team effort. Tom Dittmar gave away a penalty, the only blemish on the night (he’ll be fined accordingly Thursday night!!). The coach said if he had to single out a best player he said Paul Radice was excellent and fittingly on his 21st birthday as well. A big Easter Weekend coming up with our boys facing White City in the Cup Saturday away then Campbelltown at home in the league on Monday. 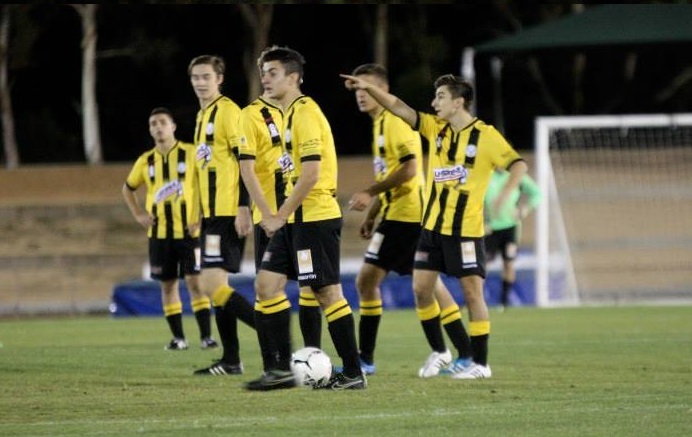 Birks reserves fought out a one all draw Friday night at Santos Stadium against Comets in a night where several opportunities went begging. Comets scored just before half time after our lads failed to clear a free kick in front of goal. Will Plush managed to equalise for Birks but on a frustrating night our lads couldn’t finish off with several chances being missed at crucial times. Daniel Scorsonelli at holding midfield was best with Jordan Maricic continuing his good form at left back whilst Captain Daniel Polli also had a solid game.